Scores of people are living in the open, exposed to harsh weather conditions following a fall out last November with owners of Claverhil North farm in Bindura. A squatter camp characterised by blue tents stands amid the tall green grass housing chirping crickets, buzzing mosquitoes and flies. Toddlers with worn out clothes play with dirt oblivious to their surroundings. Hopelessness and despair is engraved over the faces of the villagers who have been living in the makeshift shelters for 3 months now. 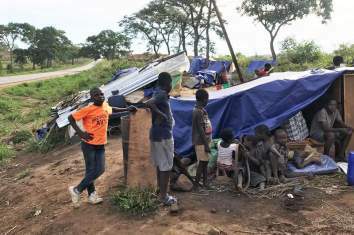 The road side camp is home to 18 families and among them, one of the elders Conwell Matope recounted how they were thrown out of Claverhill North farm which belonged to Kingsway Community Church and now being run by new owners. “Most of us relied on that church. You know how farm workers would move from one farm to another and most of the children were born here so they have nowhere to go. We are just staying here waiting for help,” he said. A potential health hazard is looming for the young children and the elderly due to poor hygiene, while the former farm workers’ food stocks have run out. Land to build safe shelters is the biggest appeal to government by the stranded people.